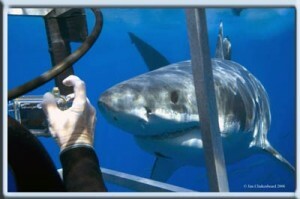 The following a story is by Paul “Doc” Anes, owner of San Diego Shark Diving Expeditions, Inc http://www.sdsharkdiving.com/, recounting a recent dive trip he took to the waters off Isla Holbox, near Cancun, to dive with the Whale Sharks. It was an easy couple of flights from the US into Cancun, Mexico. The plan was to meet the group I would be escorting outside the arrivals terminal. It didn’t work out that way, but that’s another story. We finally hooked up and motored our way in the transfer van to the village of Chiquila. At Chiquila we hopped on the ferry that would take us to Isla Holbox. My contact on Holbox was waiting for us at the ferry landing, where we loaded our luggage onto his truck and walked through town to our hotel. The Hotel Holmar had just added a new second story and featured a small pool that was great for cooling off in the afternoon. We arranged to meet at the Holbox tours office on the beach the next morning for our first day of snorkeling with the Whale Sharks. We had coffee and cookies at the Holbox tours office then were briefed on the rules for snorkeling with the Whale Sharks. Our guide, Renee, and Captain David were the same crew we had during my trip in 2006. It is a 1 1/2 hr boat ride to the viewing area off the NE tip of the Yucatan peninsula. Once in the area we spotted several Whale Sharks feeding on the surface. We all geared up and the first two were given the go signal from the Capt. Our in-water guide, had jumped in earlier to keep track of the animal. As soon as we hit the water the huge head of the Whale Shark appeared. It was really moving so we had to kick hard to keep up with the shark as he gulped water and strained out the plankton that it fed upon. Everyone had several encounters with the Whale Sharks and one couple got lucky when one of the animals stopped dead in the water and just opened and closed it mouth to feed. On the way back to the pier we stopped at the lighthouse at Cabo Catoche to wait out a rain squall that was crossing further to the west. After 20 minutes we backed off the beach and continued on our way to the pier where we disembarked. Everyone on board agreed it was a terrific experience. Back to the hotel to rinse off gear, take a shower, and then lunch on the beach at one of the seaside restaurants. After lunch it is siesta time. It is a perfect time for a nap since it is very hot during the afternoons on the island. After the sun goes down everything cools off and a gentle breeze usually blows across the island. This is the time when everyone comes out. There is usually something happening in the central plaza which is surrounded by several nice restaurants. There are also several internet “cafés” so if you just have to check your emails it is very cheap to log on. There are many small shops where you can get the obligatory “I was here” t-shirt and other trinkets for the natives back home. Everyone had a sound sleep the last night. We once again gathered at 6:30 for coffee and cookies before heading to our respective boats. We saw the same dolphins on the way out. Sandra, one the girls on the bow, shouted that she had seen a school of Golden Rays. The captain reversed course as we motored up to a huge school of Golden Rays just under the surface. There must have been several hundred 2-3 ft Golden Rays in the school. There were rays from the surface down as far as we could see into the water. It was a magical site! After everyone got pictures of the rays we continued on our original course. It was unbelievable, but we ran into two more schools of Golden Rays! We took some more pictures and continued looking for Whale Sharks. We finally found a couple of sharks, but they were moving too fast for the snorkelers. The captain then got a report over the marine radio that there was a group of Whale Sharks and Mantas close by. We raced to get to the spot to find that there were at least a dozen Whale Sharks and lots of Mantas all swimming near the surface feeding on a concentration of plankton. One of the passengers remarked “this is like Disneyland!” There were so many Whale Sharks and Mantas that they didn’t know where to look! Once back at the dock some got cleaned up to do a special tour to see the Flamingos and splash in the local cenote. I, on the other hand, opted for a massage. After an hour of this tiny gal kneading my body all over with soothing aromatic oil and warmed stones, I felt like a wet noodle. It was sooo relaxing! Hey ya gotta relax on vacation, right? After meeting for coffee the next morning we headed to our respective pangas for our last day of Whale Shark viewing. The first Whale Shark we splashed with was moving too fast for the snorkelers to keep up with so we moved on to where we could see a grouping of animals a short distance away. It was a repeat of the previous day with 12 Whale Sharks and several Mantas concentrated in an area about the size of a football field. There were also several Bottlenose Dolphins cruising nearby. Everyone onboard the panga got several opportunities to swim with the Whale Sharks and Mantas. The last Whale Shark we snorkeled with was a small female only about 15 ft long. The thing that was special about this particular Whale Shark was that it was moving very slowly through the water as it concentrated on feeding and it didn’t seem to mind having snorkelers nearby. Several times during the 45 minutes that snorkelers were near the animal it would stop its forward swimming and go tail down-head up in a vertical position and just open and close its mouth sucking water then straining out plankton. This behavior allowed the snorkelers to stop swimming themselves and get even closer to the animal without having to keep up with it. I had seen behavior like this once before the previous year and it is an underwater photographer’s dream as it allows them the opportunity to compose their photo while stopped in the water and also to get close up images of the open mouth of the Whale Shark. After cleaning gear and setting it out to dry, some of us met for lunch at one of the beach restaurants while one opted for a massage and another for horseback riding. Later that evening all in the group ended up at a funky little restaurant called La Rustica that is owned by a German couple. Deiter runs the kitchen and Martina takes care of the tables. Who would have guessed you could get “weinerschnitzel” in tropical Mexico! Our group was leaving on the 9 am ferry so we loaded the baggage truck and made our way to the ferry landing. After the short crossing we loaded up the vans going to the airport for those catching their afternoon departures. We said our good-byes and checked in for our individual departing flights. Isla Holbox is what I imagine Mexico was like 40 or 50 years ago. The place has a slow island pace of its own. Transport is an easy 3-hour air conditioned van ride through the Maya countryside. You can also take one of the new bus coaches leaving from Cancun. If you only want to go for a day, you can fly in a small plane from the Cancun airport to the grass runway on Holbox. You can only take about 10 kg. of luggage with you on that flight. Isla Holbox is a magical place. In my almost 40 years of diving all over the world, I have never seen more Whale Sharks in one place at one time. The big bonus here is that often Manta Rays are in the same area feeding on the abundant plankton. This is a great family trip since you are using snorkel gear. Even if you are not a strong swimmer the guides will provide you with a life jacket and pull you through the water so you can get up close to one of these gentle giants. Season is mid June-mid August. Hello Kate! Unfortunately, we’re not a booking engine, so I wouldn’t know about hotel availability, but I found a link with some information on the Holmar (http://www.mxtravel.com/holbox.html). I’m also including another link for another two hotels plus some extra info on Isla Holbox. I hope it helps! Me and my family are holidaying to cancun on the 18th of august 2009 and two of us would love this experience, however neither of us have any diving/ snorkling experiance, would this be a problem? and if no is the answer how can we book? If we have to wait till we are in mexico can we find you easily? thanks . . chris. I don’t think you would have any problems, as these outfitters specialize in tourists and not everybody has that kind of experience. Here are a couple of links you can check out and perhaps contact them via email to get a better idea of what you can do. Try a Google search of “whale shark tours holbox” – that will also net you plenty of information.